Meet Pebble's New Smartwatches & "Ultra Wearable"
Pebble was a smartwatch pioneer with their first wearable gaining tremendous success on Kickstarter. Since then, you could argue that the company has fallen behind its competitors in terms of both sales and features. Pebble now says that they want to be the Swatch of smartwatches – affordable but cool and unique. Today they released three new products. The first is the Pebble 2 which is the successor to the original Pebble smartwatch. Next we have the successor to the Pebble Time – the Pebble Time 2. Lastly we have the Pebble Core, a 3G enabled wearable built mainly for runners. The Pebble 2 has a slightly different design compared to its predecessor and arguably looks better. It still has a black and white display but it’s coated with Gorilla Glass instead of plastic this time around. The smartwatch features a heart rate sensor too along with a microphone and is water resistant up to 30 metres. Pebble has stated that fitness tracking has become one of the three key elements of smartwatches along with basic communication and notification access so from now on every smartwatch they make will have a heart rate sensor. Battery life is the main highlight of Pebble smartwatches and the Pebble 2 will last up to one week on a single charge. The Pebble 2 is available on Kickstarter and will ship in September for $99. The Time 2 like the Pebble 2 has a heart rate sensor, microphone and water resistance up to 30 metres. Unlike its cousin, it is made of steel. The colour E-Paper display now has a much slimmer bezel thus giving it 53% more viewable screen real estate than the Pebble Time. Battery life will be around 10 days. The Pebble Time 2 is on Kickstarter right now for $169 and will ship in November. 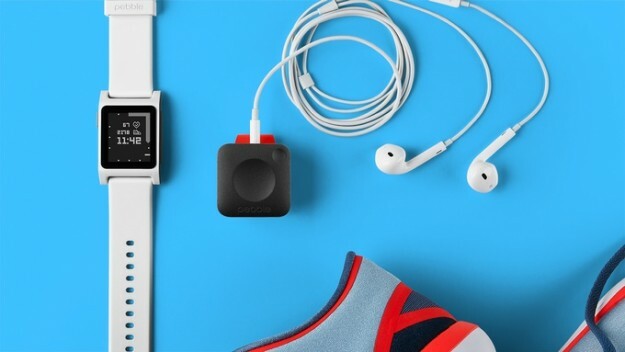 The Core is an entirely new product from Pebble and is aimed at runners. The wearable has a magnetic latch which you can use to attach it onto a belt loop or pocket. The device has a battery life of about 9 hours and is Qi compatible so you can charge it wirelessly. It has GPS to track runs and a 3G modem which is used to play Spotify Playlists. A 3.5mm headphone jack allows you to connect your headphones but you can also connect over bluetooth. The Core runs on Android instead of any proprietary Pebble OS and the company hopes enthusiasts will take advantage of this and hack the device to execute cool tasks. Right now you can use the Core to hail an Uber or send an emergency SMS. Pebble’s new offerings aren’t groundbreaking and is mostly the company catching up with the competition. The affordability and community remain strong attractions to the ecosystem but the products are quite lacklustre and still feel like a proof of concept like the original Pebble. The simplicity of these devices though may be what attracts you as there are a lot of people who just want updates and notifications on their wrists instead of disruptive games and full blown apps.